Physical infrastructure in the United States is crumbling. The American Society of Civil Engineers has, in its latest report, given American roads and bridges a grade of D and C+, respectively, and has described roughly sixty-five thousand bridges in the United States as ""structurally deficient."" This crisis--and one need look no further than the I-35W bridge collapse in Minnesota to see that it is indeed a crisis--shows little sign of abating short of a massive change in attitude amongst politicians and the American public. 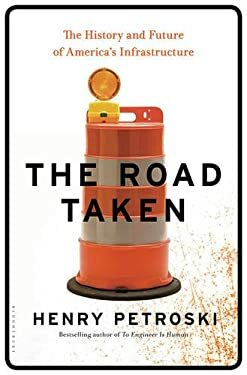 In ""The Road Taken,"" acclaimed historian Henry Petroski explores our core infrastructure from historical and contemporary perspectives and explains how essential their maintenance is to America's economic health. Recounting the long history behind America's highway system, Petroski reveals the genesis of our interstate numbering system (even roads go east-west, odd go north-south), the inspiration behind the center line that has divided roads for decades, and the creation of such taken-for-granted objects as guardrails, stop signs, and traffic lights--all crucial parts of our national and local infrastructure. His history of the rebuilding of the San Francisco-Oakland Bay Bridge reveals the complex and challenging interplay between government and industry inherent in the conception, funding, design, and building of major infrastructure projects, while his forensic analysis of the street he lives on--its potholes, gutters, and curbs--will engage homeowners everywhere. A compelling work of history, ""The Road Taken"" is also an urgent clarion call aimed at American citizens, politicians, and anyone with a vested interest in our economic well-being. The road we take in the next decade toward rebuilding our aging infrastructure will in large part determine our future national prosperity.